Dan Brown, the author of Deception Point, Angels and Demons, The Da Vinci code Digital Fortress and The Lost Symbol has announced that his forthcoming novel will be called Inferno and is released 14th May 2013. The new novel features renowned Harvard symbologist Robert Langdon and is set in Italy, where Langdon finds himself in great peril once again after he starts examining Dante’s medieval poem Inferno,which was written as an allegory of the journey through hell and depicts hell as nine circles of suffering located within the earth. The book is the fourth in the series featuring protagonist Robert Langdon, which started with Angels and Demons in 2000, followed by The Da Vinci Code in 2003 and The Lost Symbol in 2009.So far Both Angels and Demons and The Da Vinci Code have been made into films starring Tom Hanks, and Columbia Pictures is also working on a film version of The Lost Symbol. He also revealed that the songs ranged from “funky” to “sleazy”, “psychedelic” to “rock”. Many songs on the album are observational, while some are social commentary. The title track “The Next Day” is based on medieval English history and is about somebody who was a tyrant, while The next track “The Stars (Are Out Tonight)” is a rock number, and the third track “Boss of Me” harks back to Bowie’s mid-Seventies sound and is one of the slower, funky songs on the album. Meanwhile The last track on the album “Heat” is a “classic Bowie ballad”. 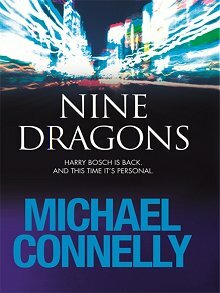 I am currently reading Nine Dragons which is the 14th novel in the Harry Bosch series and the 22nd book (21st novel) by American crime author Michael Connelly. The novel is partly set in Hong Kong, where Bosch’s daughter Maddie and ex-wife Eleanor Wish live and starts when Bosch and his partner Ignacio Ferras are called to investigate a murder at a Liquor store in the L.A. ghetto. The owner, Mr. Li, has been murdered, leaving behind a grieving widow who did not speak English and two children: a daughter Mia, who looked after her parents, and a son Robert, who ran a second Liquor store.the Asian Gangs Unit headed by Asian-American Detective David Chu is called to investigate, Bosch then discovers that that the owner made a weekly payoff to a triad every week at about the time he was murdered. Chu locates the bagman for the triad, and he and Bosch arrest him just as he is about to flee to Hong Kong. However, Bosch receives a phone threat and then a video message from his daughter Maddie, who lives in Hong Kong and whom he only sees twice a year. The message simply shows her held in a hotel room, kidnapped. His ex-wife Eleanor called the Hong Kong police, who told her that Maddie was probably a runaway and to call back Monday if she hadn’t returned by then.So Bosch flies from L.A. to Hong Kong to rescue Maddie, who is traced to to a particular section of Kowloon,(The name Kowloon translates as “Nine Dragons”) Harry follows the trail to a high-rise multi-ethnic flophouse (a likely referral to Chungking Mansions), which Eleanor refers to as a “post-modern Casablanca, all in one building.” However Harry crashes into the room without waiting for backup and finds the room empty with evidence that Maddie’s kidnapping is part of China’s black market in organ trading.